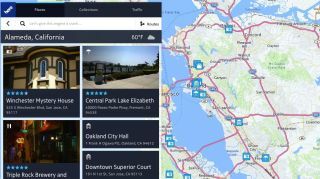 Nokia's Here maps may be the hottest commodity on the market right now. How hot? Try $3 billion ... hot. Uber has reportedly submitted a bid for as much as that figure to snap up Nokia's mapping service, according to The New York Times. Uber is said to be up against a consortium of German auto makers, including Audi, BMW and Mercedez-Benz, China's search engine firm Baidu, a private equity firm and, at least at one time, Facebook. Everyone wants Here, and Nokia could hand over the reigns by the end of the month. What's in it for Uber? Uber would stand to gain a number of benefits if it bought Here. For one, it'd flush out the mapping features of its taxi/ride-sharing service, which currently relies on bits from Google Maps, Apple Maps, other companies' mapping data and its own online data. Analysts speaking to the NYT noted Here could help Uber Pool in pairing coordinating ride-shares. Buying Here would also help Uber distance itself from Google, a backer of Uber through its venture capital division. Uber is apparently facing stiff competition from the automakers for Here, however. Here dominates the built-in car navigation system market and is likely seen as a boon for companies trying to expand their in-car technologies as well as develop autonomous vehicles, such as Mercedes. Will Uber win out? Only time will tell.